Lloyd is actually the father of the custom art knife as we know it today. He was the first to popularize it at gun shows and soon all the other (15 or so at the time) knife makers started embellishing their work. Sure, there were a few fancy knives before, but not the rage kicked Lloyd caused in the 60s. So, here is a piece de resistance by Hale. 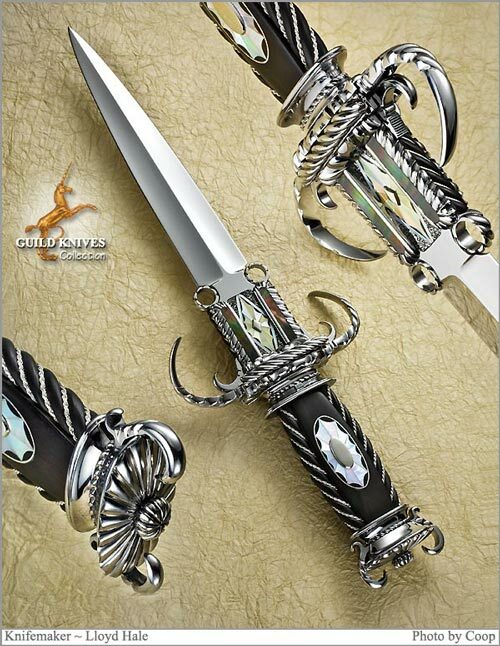 It is 17 inches long and has sterling silver braid wire snaking it's way around the handle. The filework is amazing and not seen in other makers work. The inlays of 5 different organic materials done in medallions of various shapes are most artistic. Harmonious Complexity is the banner of this large Dagger.